« It’s Your Birthday, So How ‘Bout Some…Donuts? Alrighty! Another way to use these amazing greens: as a pocket! I made up a caponata of sorts with lotsa wintery goodness, let it cool and then stuffed some steamed collard leaves. Drizzle in a bit of olive oil (couple of teaspoons worth) and heat. Add in diced eggplant, squash, onion, garlic, and a handful of thyme sprigs tied together with some kitchen string [really makes it easy to remove them later]. Sauté until the squash is slightly tender to a fork. Add in dried fruit and wild rice. Sauté for another few minutes and then set aside off the heat to cool. Lightly steam the collard leaves and allow to cool. 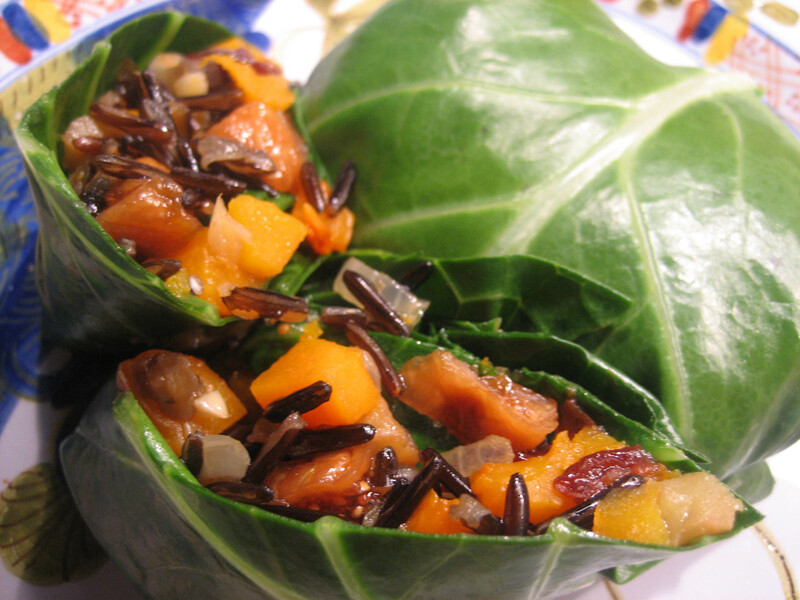 Place a collard leaf flat on a cutting board and fill with a few tablespoons of the filling. Roll up like a burrito or an egg roll. After you have as many as you wish, place them into the steamer and heat through, shouldn’t take more than a few minutes. Enjoy!